For the past ten years the First Unitarian Church of Louisville has worked to lower its energy usage, and has made many improvements using creative fundraising strategies, such as a scrap metal drive to buy dozens of compact fluorescent lights to replace incandescent bulbs. As more money came in, they replaced two refrigerators and a freezer with Energy Star-rated models that use less than half as many watts as the old ones. Then, in 2013 they voted to take bolder steps to reduce their energy consumption. 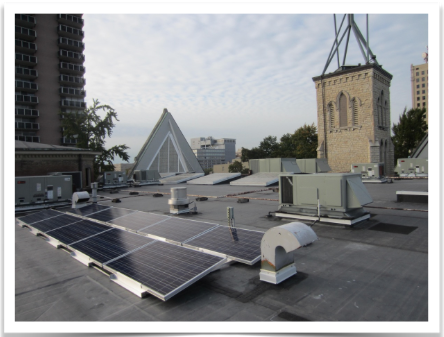 They replaced their hot water heater, did a LED lighting retrofit, installed spray foam insulation below the most-used part of the church, replaced eight 24-year old HVAC units with new units with an EER rating of 10.9 or higher, and installed a new roof with a 30.6 R-value insulation.